I just have to share this website with you. It's called Font Browser and it is so cool. It detects all of the fonts on your system and you just paste your text into the box and you can see the text in any font on your computer in several different sizes! So cool! How cool is that image? Yeah, that's me in the lower left corner! 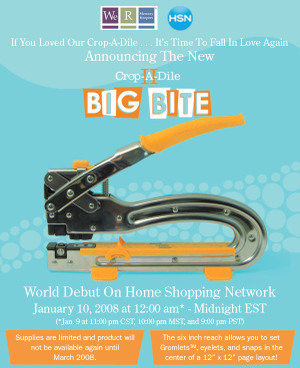 It's up on the Scrapbook Dimensions website! 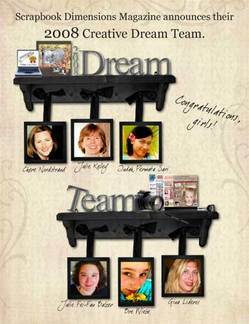 Check out the Scrapbook Dimensions Blog! Lots of free hybrid tutorials from the Dream Team. I'll be posting a project on that blog on Monday. Also, the new issue of Scrapbook Dimensions is on the newstands now, so be sure to pick up a copy! So, I thought I'd procrastinate (even though it's 2:30 am) a little bit more and share some random bits and pieces of stuff. 1. I'm headed for a three day crop outside of Boston, run by Christina of the Rubba' Stampa' and Scrapbooka's Attic. I went to this crop last year. It's small (about 20 women, maybe a few more) and Christina is an incredibly generous host (big goodie box, lots of drinks and snacks and tons of door prizes). Plus, I really like her as a vendor. Lots of stuff that's totally my style. I'm dragging my Mom with me, but because she doesn't really scrap (except with me), I have to pack her bag and print her photos and it just adds another layer of stuff to do. But, Mom, if you're reading this. I'm so happy to do it! And, thank you for coming with me! 2. 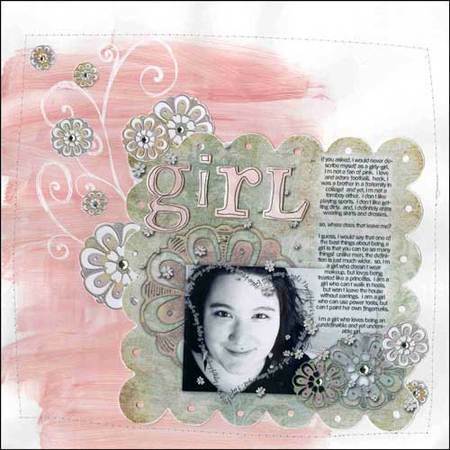 Maria of Kitchen Sink Stamps has invited me to be a Guest Designer for February! A while back, I did a review of Kitchen Sink Stamps and I fell in love with them. The designs are fantastic and the quality is among the best I've ever used. Maria is also one of the loveliest and most generous people around, so that makes it even sweeter. 3. Kick-off week at My Creative Classroom is going swimmingly! I've participated in three online chats in the last two days and they've been a lot of fun. I think I spent about four hours online today! No wonder I haven't accomplished anything! LOL! The other good news is that my free class has been getting rave reviews! Several students have posted their half-black-and-white-half-color photos and they're beautiful! 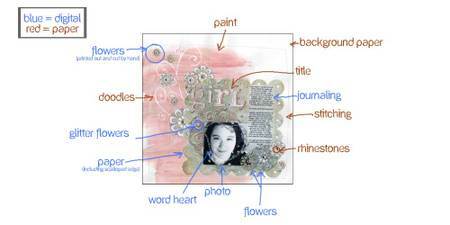 Students have said that the lesson is easy to follow, and makes Photoshop seem simple. I'm very pleased. Check it out if you get a chance! 4. My OTT light bulb broke. Well, to be more precise, it burned out and I was trying to get it out of the socket so I could see the wattage and reorder when it fell onto my desk. I never realized how dependent I was on it until it broke. It has been so hard to work on anything for the past day-and-a-half. Stink-o! I have the 25 watt floor model and it is one of the most important things in my crafting space! 5. The very talented Nathalie has redesigned her blog and added links so you can find all of her techniques and interviews and reviews and such in one place. It's a great resource! Her posts are in both German and English. Pretty impressive! That's about all for now! Thanks for stopping by and I'd love the chat with you on Thursday at My Creative Classroom. My chat is from 11pm-midnight (EST, which is GMT -5). Don't leave me alone talking to myself! LOL! My Creative Classroom's big opening celebration kicks off today! There's a brand new site, which is much more user friendly! There are contests with prizes! There are live online chats with all of the teachers! There are a TON of FREE classes! The Kick Off Celebration will last all week, so be sure to stop in and look around! One Note: You will need to register for the site to access all the fun. It's totally FREE and very quick to do. Julie will show you how to convert part of a photo to black and white in Photoshop Elements in this easy to follow tutorial. Level: This course assumes that you have no knowledge of Photoshop Elements and are a complete beginner. Supplies: A computer with Photoshop Elements (any version) installed and a digital photo. **If you don't own Photoshop Elements, you can download a free 30 day trial from the Adobe website. I hope you will come by and say, "hi" even if it's just for five minutes! Honestly, I'm a little afraid of being there all by myself twiddling my thumbs! Help us celebrate Universal Letter Writing Week by posting a letter-themed layout in our online Reader Gallery during the week of January 21-25. 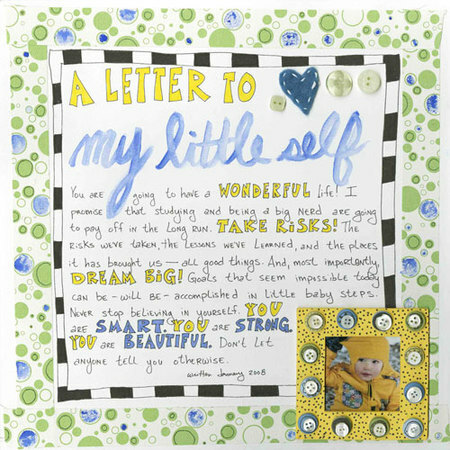 What do we mean by "letter-themed layout" Write a letter to yourself, your spouse, your child, your friend, your mother, your brother, "anyone"and use it on a scrapbook page. Use the keywords "Universal Letter Writing Week" in the comments so we can find your layout. At the end of the week, Elizabeth Dillow, author of The Scrapbooker's Almanac, will select five favorite layouts and announce them in the Reader Gallery. Each winner will receive a copy of Elizabeth's book and one grand-prize winner will also receive a cool letter-writing kit from Elizabeth. Only layouts posted January 21-25 will be considered official entries. Post as many letter-themed layouts as you like. No purchase necessary. That frame was something I got in my Trash to Treasure swap at SIStv. I thought is was soooooooooo ugly, but I wanted to make something rock star cool out of it. So, I doodled all over it and then added buttons. I'm not sure if it's rock star cool, but it is totally funky! So, I'm happy! Finally, I just got my "Big Bite" in the mail today! I haven't really had a chance to play with it, but it is pretty awesome so far. I have long been sad that my Crop-a-Dile only reaches an inch or less into anything. The big bite has a six inch reach! So cool! And, it sets these things called "gromlets." They're not eyelets or gromets, but something in between and so very, very cool! This is the first time I've ever ordered from the Home Shopping Network and at first I was a bit embarrassed. But, I'm glad I did! I'll try to post something that I make with the Big Bite soon! Hybrid, hybrid, hybrid! I'm so excited about hybrid I can't even tell you. It has turned all of my "Why would I ever want to go digi? I love my paper and glue too much!" whines off. With hybrid, you get the best of both worlds. Even with a standard ink jet printer (no large format here!) and scrapping 12x12, you can do so much with your computer! If you're at all curious about trying out hybrid, I'm going to be teaching a hybrid scrapbooking class in March through My Creative Classroom. (You have to scroll to the bottom to find my class.) So, check it out!